The stairs lead to the Museum’s Anna Wintour Costume Center, where the exhibit was held. 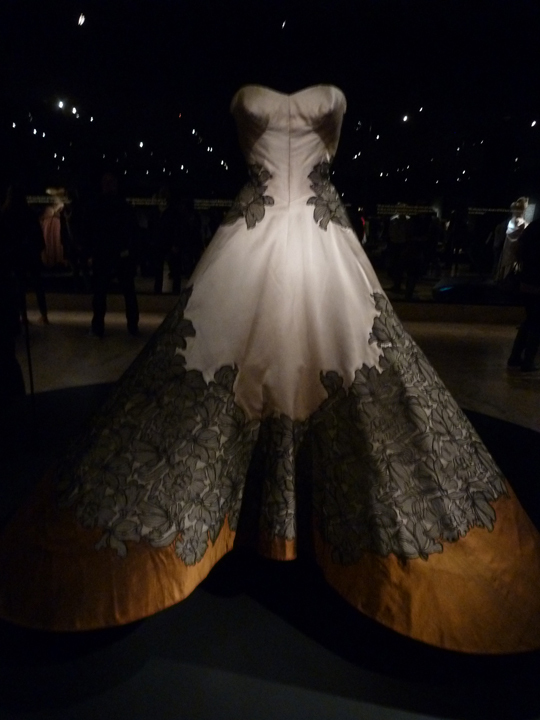 The latest exhibit of the Metropolitan Museum of Art’s Costume Institute opened on the 8th of May. Entitled “Charles James: Beyond Fashion,” the exhibition features about 75 of Mr. James’ artwork in luxurious fabrics, varied colors and fantastic shapes. Keep in mind that each one of these dresses is stitched together by hand. No machine stitching is used in couture clothing. I got to see the exhibit eight days later on a Friday night. I highly recommend visiting the Metropolitan Museum of Art on either Friday or Saturday nights. Closing times is 9 PM each day. The place is practically deserted. It’s deliciously quiet! You can eat dinner in any one of its three cafés, or try the ground-floor cafeteria for a more-economic, self-serve meal. The show is split between two gallery spaces. One is in the ground floor’s recently renovated and renamed Anna Wintour Costume Center, which includes cocktail dresses, day coats and dresses, hats, sketches, childhood photos of James, and news clippings. Without a doubt, the highlight of the show is found in the first-floor gallery; Mr. James’ stunning ball gowns can be relished there! James’ breathtaking Four-Leaf Clover ball gown was selected as the dress to represent the exhibit, to be featured on the invitation to the Museum’s Costume Institute’s Ball and an edible version was on the Ball’s dessert menu. The dress was designed in 1953 for Austine Hearst, wife of William Randolph Hearst, Jr., to wear to the inauguration of President Eisenhower. It is the height of mid-twentieth-century glamour and elegance. Another version of the Four-Leaf Clover ball gown is presented with a leafy-green pattern. In 1993, Erik Lee Preminger donated 24 Charles James garments owned by his mother, Gypsy Rose Lee, to the Brooklyn Museum of Art. At the end of 2008 the Brooklyn Museum arranged to transfer its extensive collection of American and European costumes and accessories to the Metropolitan Museum of Art. Included are nearly 200 garments by Charles James and 600 related materials, including drawings and patterns of his work. This arrangement will allow the items to be properly cared for and exhibited. Millicent Rogers (1902–1953) was a Standard Oil heiress; her fortune was reportedly valued at $20 million in the 1920s. The gossip columnist Louella Parsons dubbed her “Miss Moneybags.” Cecil Beaton, who photographed her, was kinder, saying she had the face “like a lotus flower.” Directly above is the gown, a frothy mix of pale pink silk faille and saffron silk taffeta by Mr. James, she is seen wearing in the photo immediately above that. In the late 1930s and early 1940s Mr. James created a series of dresses he called Ribbon Dresses, one with a matching cape. The low-tech way Mr. James constructed his garments. I hope I can explain clearly the high-tech part of the exhibit. This feature really must be seen to be appreciated. Each of these exquisite creations has its own scanning camera, which is connected to a video screen. The device moves around the garment. As it does, the section of the dress that the camera scans is detailed on the screen with an explanation of how it was constructed. The screens are also used to give a history of the garment, as well as displaying photos of the gowns worn by the women for whom they were created. Mr. James’ unique eiderdown-filled, white silk-satin evening jacket was seen on the cover of Harper’s Bazaar in 1937. The designer described the form as “floating arabeques.” Mr. James married Nancy Lee Gregory, a young woman of means from Kansas 20 years his junior, in 1954; the marriage ended in 1961. They had a son, Charles, Jr., and a daughter, Louise. What fabulous works of art, and so beautiful.